Located in Folsom, CA, Empire Ranch Alzheimer's Special Care Center is a residential option for those seeking elder care solutions. A member of the JEA Senior Living family of centers, Empire Ranch offers a compassionate design combining assisted living with dementia care. The Empire Ranch Alzheimer's Special Care Center model incorporates each individual resident's unique life story into its memory care design. Utilizing our distinctive Meaningful Moments® approach, the Empire Ranch team provides a warm and meaningful assisted living environment. Our recently-opened Alzheimer and dementia special care center is already recognized for bringing a true "partner in care" approach for memory care treatment to Northern California and the Sacramento region. 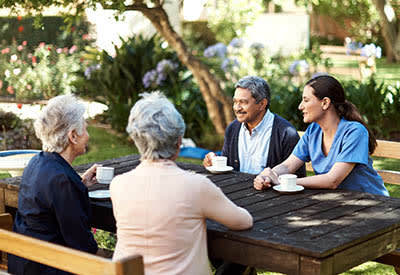 Family and friends are members of each resident's unique specialized team, ensuring an all-important link supported through personal experience and familiarity. Empire Ranch Alzheimer's Special Care Center is one of the newest members of the JEA Senior Living family, comprised of dementia and memory care centers and programs stretching from the Pacific to the Great Lakes. Embracing the mission to "honor the experience of aging", we are compassionately committed to the comprehensive health treatment of our residents. Below is additional information about the services offered at Empire Ranch Alzheimer's Special Care Center.